This is the first article in a four part series that will walk readers through how to rate and value a stock. For this series, we will walk you through the process of valuing chemical manufacturer DuPont (DD). Our first step to gauge the value of a company is to determine the true, after-tax cash flows generated by its operations. We call this Net Operating Profit After Tax (NOPAT). Unlike GAAP net income, which can include financing costs and non-recurring items, NOPAT measures only those cash flows generated by the continuing operations of the business. Figure 1 shows how reported earnings have been a poor indicator of the actual operating profitability for DD since 2000. 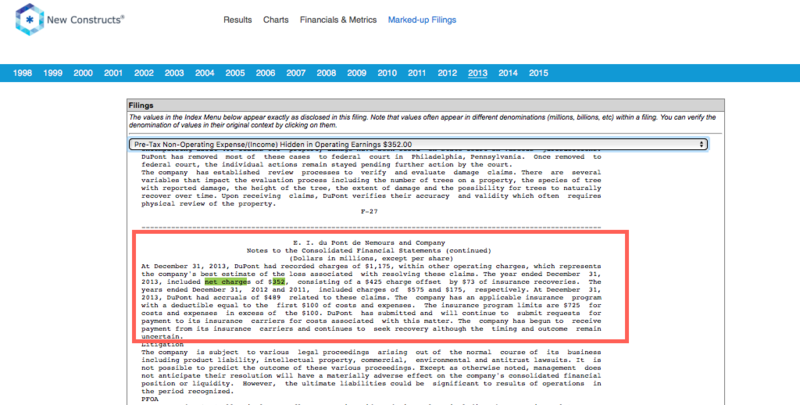 Furthermore, it shows that in the most recent fiscal year, 2013, reported earnings overstated DD’s profitability. DD reported earnings of $4.84 billion in 2013, but its actual NOPAT was just $4.07 billion. Here are all of the adjustments that explain the $770 million difference between those two numbers. 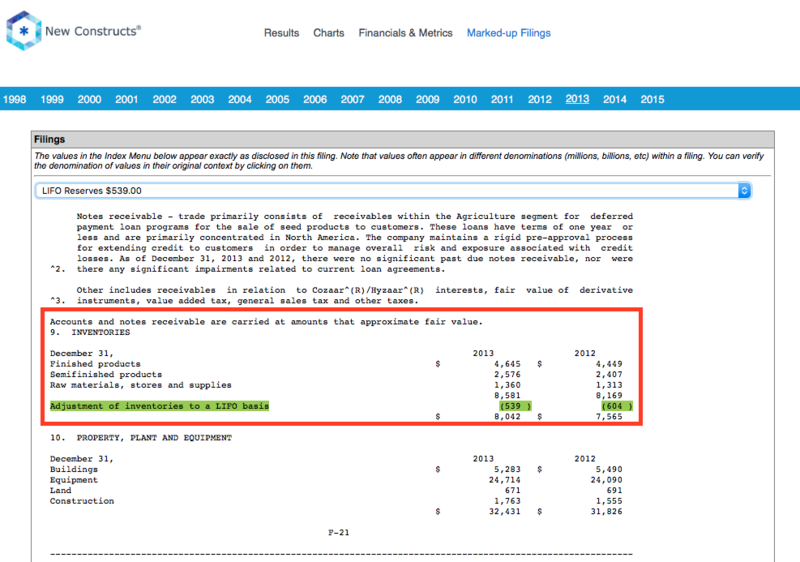 Buried in the footnotes of DD’s annual Form 10-K are $434 million in various non-operating, non-recurring expenses. The largest single item in this category is a $352 million charge to resolve damage claims against its herbicide, Imprelis. These charges are all not a part of the continuing operations of the company and will not recur in the future, so we add back the $434 million to NOPAT. Companies treat their pension plan assets in a variety of different ways. Changes in actuarial assumptions (i.e. the discount rate and expected return on plan assets) can cause big swings in total reported net pension liabilities. Some companies immediately recognize these actuarial gains and losses, while others smooth out their earnings by amortizing pension gains and losses over several years. As a result, reported incomes between companies using different methods of pension accounting lack comparability. In order to resolve this discrepancy, we include service costs and amortization of prior service costs as the only pension-related expenses in NOPAT. All other costs, which include interest costs and amortization of losses, are excluded from NOPAT. We add the $727 in non-operating pension costs back to NOPAT for DD. 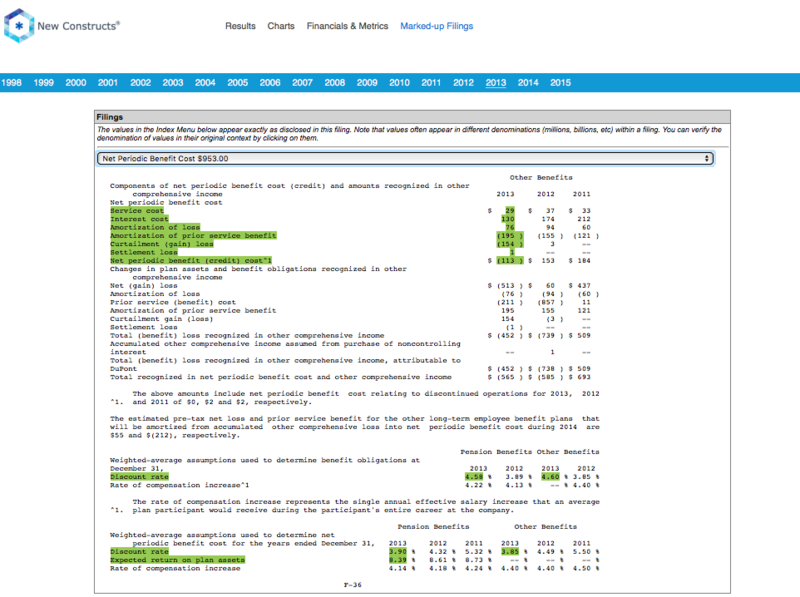 Pension data is often buried deep within the financial footnotes in annual reports. For DD, the pension data is on F-35 and F-36, or the 81st and 82nd page overall of the 10-K. Note that when we refer to “Hidden” items, we mean that those items cannot be found on the income statement. They are buried within other items on the income statement. They can only be found in the footnotes or Management Discussion & Analysis (MD&A) sections of the SEC filings. 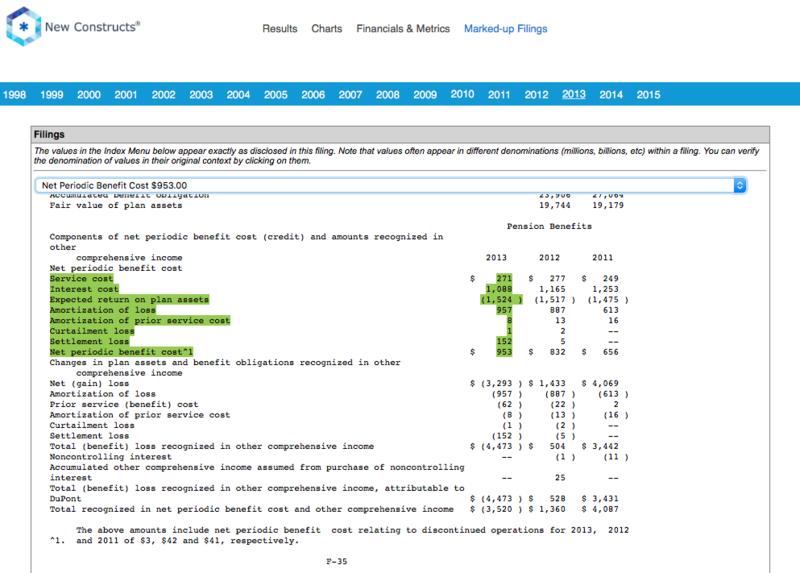 There are a number of non-operating items that are reported directly on the income statement. The largest item we exclude is $448 million in interest expense, slightly offset by $136 million in interest income. Interest is a financing cost, not an operating one, so we exclude it from NOPAT. Companies have the choice to report their inventories using the LIFO (Last In First Out) or FIFO (First In First Out) methods. Which method a company uses affects both the inventory balance and the cost of goods sold on the income statement. GAAP requires that any company that uses LIFO must disclose the difference between its reported inventory balance and what inventory would have been under FIFO. This difference is known as the LIFO reserve. In order to make all companies comparable, we calculate inventory and cost of goods sold as if all companies used FIFO. In order to adjust cost of goods sold to a FIFO basis, we add back the change in the LIFO reserve to cost of goods sold. DD’s LIFO reserve decreased by $65 million in 2013, which results in a negative adjustment to NOPAT. Operating leases are often used as a form of off-balance sheet debt. When a company wants to acquire an asset, it can either take on debt to buy the asset, or it can lease that asset. There is no operational difference between these two methods, but they are accounted for in very different ways. To resolve this discrepancy, we discount operating leases to their present value and treat them as debt. This adjustment means, however, that a portion of the company’s rental expense is really an implied interest expense, which is a financing cost that must be removed. DD currently has $1.5 billion in outstanding lease commitments, or the equivalent of $1.3 billion in off-balance sheet debt when we discount those future commitments to their present value. 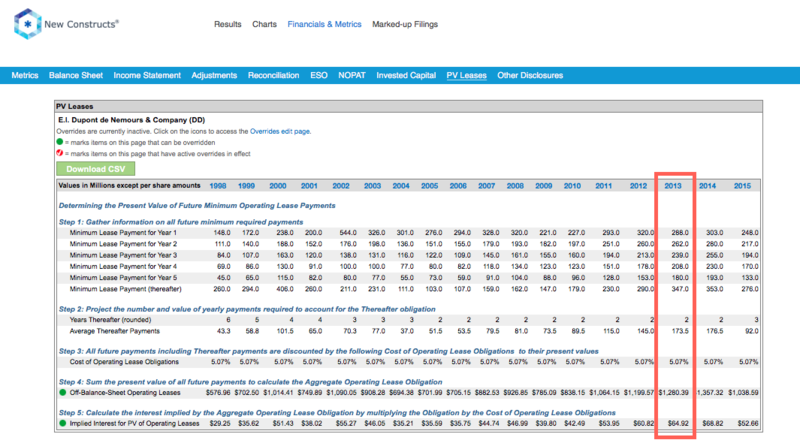 With DD’s cost of debt at 4.2%, we calculate the implied interest on its operating leases to be $56 million. We add back that amount to NOPAT. When a company sells or shuts down a portion of its business, it breaks out the after-tax income from that business on the income statement. Since NOPAT measures the recurring operating profits of a business, and income from discontinued operations will not recur in the future, we remove this income from NOPAT. DD sold its Performance Coatings business to The Carlyle Group in February of 2013. It recorded a pre-tax gain of $2.7 billion on the sale, which resulted in roughly $2 billion in after-tax income from discontinued operations. So far, we’ve increased NOPAT quite a bit by eliminating non-operating and non-recurring items. However, these are all pre-tax expenses or gains, and NOPAT is an after-tax measure. In order to accurately calculate NOPAT, we have to calculate the taxes owed only on the adjusted operating income. This calculation can be quite complex, as non-operating losses and gains often generate tax benefits at different rates than other items, so we can’t just use the reported tax rate on the income statement. For DD, we calculated that its true cash tax rate was 18.9%. The company’s pre-tax operating profit (NOPBT) was ~$5 billion, which made its cash operating taxes $962 million. The difference between its cash operating taxes and its actual income tax expenses was $336 million. When we total up all these adjustments, we find that net income overstates NOPAT by ~$770. Some investors might recognize and remove some of these non-operating items, but unless they make all the above adjustments they do not get the complete and accurate measure of the company’s after-tax cash flow (NOPAT). Profit seems like it should be an easy number to calculate. After all, it’s just revenue minus expenses. As this article shows though, complex accounting rules make true after-tax profit difficult to measure. Not all companies have as many adjustments as DD, but nearly all will have at least some difference between GAAP net income and NOPAT. It takes a lot of meticulous work to comb through all the filings and get all the key details, but it is more than worth it. Step 2 can be found here. To learn more about the adjustments we make to calculate NOPAT, visit our Accounting Loopholes section.